Having missing teeth makes it harder to eat and can negatively affect your level of confidence. Not only that, if you have several missing teeth, the absent tooth roots can’t do their job of stimulating the underlying bone and resorption can result. This process can lead to significant bone loss, changes to facial contours, and a prematurely aged appearance. Braveland Family Dental offers dental implant restoration to repair your smile and replace missing teeth. Call us today to learn more. Because dental implants replace the entire tooth, down to the root, your jaw can remain healthy and your restoration secure. Three other significant benefits to dental implants are its improved stability, durability, and freedom from the embarrassment of slipping dentures. beauty and function to your smile. 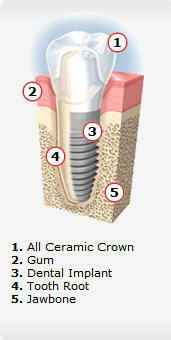 Implant-Supported Crowns – For single-tooth replacement, a crown is secured to one implant post. Implant-Supported Bridges – To replace a row of missing teeth, a minimum of two dental implants can support a bridge. Implant-Supported Dentures – Generally, four to six implant posts per arch are used to support dentures. Implant-supported dentures are permanent, but patients have the option to receive removable overdentures, which are stabilized with at least two implant posts. Treatment with dental implants is a surgical procedure. Our dentists perform a full assessment of your gum and jaw health to ensure dental implants are right for you. If you need any preparatory care, such as a bone graft or treatment for advanced gum disease, our practice can coordinate your care. The warm and friendly team at Braveland Family Dental provides treatments that contribute to your oral and overall health. Call our Burnsville dental office today to schedule a consultation.